Mountain pants sú pripravené na traky a upravená pasová očká pojmú opasok až 4,5 cm (1 ¾ palca). Vytvarované kolená s vyberateľnými výstuhami ponúka prídavnú ochranu pri výstupe či plazení. Dve vrecká na zips a postranné vrecko na zips pojmú drobné predmety v perfektnom dosahu a bezpečia. Ďalšie dve veľké vrecká so uzatvárajú tichými uzávermi, ktoré neprezradia vašu pozíciu ... Nezabudnite dodržiavať pokyny výrobcu týkajúce sa starostlivosti - typicky nájdite na vnútornej značke. Fabric Details: Brushed Polyester Knit Face .DWR Finish. Features: Quiet Raingear. 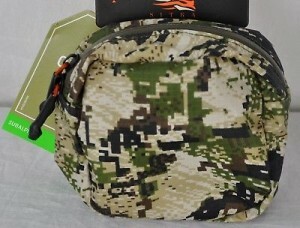 Brushed Polyester Knit Backer Zippered Pockets to Protect Your Gear. Inclement weather often presents unexpected opportunities when chasing big game, and the Thunderhead Jacket helps you stay dry and on point. GORE-TEX® 3L laminate provides 100% water proof protection sandwiched between a brushed polyester knit face and backer so that you can sneak through the storm undetected. The minimalist design is highly packable, fitted forearms offer ample string clearance, and shaped arms allow for full range of motion. A drawstring hood pulls close without hindering your peripheral vision and a zippered chest pocket keeps small essentials close at hand. Čiapka Jetstream Beanie je ideálna pre výstupy strmým horským terénom vo veľkom chlade, či pri čakaní na zver po dlhé hodiny na veternom vrcholku hrebeňa. Mikroplyš s jemným vlasom zabezpečuje teplo, zatiaľ čo membrána WINDSTOPPER® chráni vaše čelo a zátylok hlavy pred vetrom. Priedušný pás sa štvorsmerový strečovou pružnosťou zahrieva zadnú stranu krku a uši bez toho aby blokoval sluch. The Jetstream Beanie is ideal for charging up steep faces in bitter cold, or sitting motionless on a windy ridge top. A lofted micro-grid fleece backer delivers warmth, while the WINDSTOPPER® membrane blocks drafts from your dome and forehead. A four-way stretch, air-permeable band warms the back of your neck and ears without impeding hearing. Tieto nohavice z novej ľahkej série Sitka CORE ľahkej termo spodnej bielizne s anatomickým strihom a vloženým v schode tvoria základ odevného systému pre lov vysokej mobility. Dvojzložkový polyesterový materiál "dýcha", účinne odstraňuje vlhkosť z pokožky a tým ochladzuje telo. Technológia trvalého ovládania zápachu Polygiene® neutralizuje telesný pach, zabraňuje množeniu baktérií a húb, ktoré ju spôsobujú. - Komfortný plochý elastický pás. Features: Lightweight, breathable internal mesh knee pad pockets (knee pads not included).Mesh-backed hand and cargo pockets are highly breathable and light. 4-way stretch Cordura Nylon woven is lightweight, durable and dries fast. 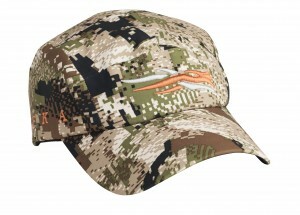 Articulated patterning combined with a Performance Fit. Weight: 340grDesigned for hot days spent charging in the mountains, and early season endeavors, the Ascent Pant features meshbacked pockets for ventilation and an internal mesh knee pad pocket if added protection is desired. For hot weather or active hunting, the Ascent Pant is a mainstay of hunters across the West. Lightweight and ultra-breathable like the rest of the Ascent line, the Pant features a quick-drying, 4 way stretch brushed nylon fabric and anti-stink Polygiene® treatment to keep you cool when the heat is on. The Ascent Pant expels heat and perspiration to keep you comfortable as you chew through the early season miles. Scrambling or bushwhacking through blown down timber requires zero restrictions. The Ascent Pant's low profile waist band won’t chafe or bunch, and articulated knees are shaped for hunters on the move. Knee pad pockets offer optional protection if desired, and all pockets are mesh backed for added ventilation, and a gusseted crotch provides full range of movement. The Thunderhead Pants are the perfect extension of the Thunderhead Jacket, featuring GORE-TEX® Laminate with a quiet, brushed polyester knit face for ultimate weather protection that gives nothing away.Inclement weather often presents unexpected opportunities when chasing big game, and the Thunderhead Pant helps you stay dry and on point. GORE-TEX® 3L laminate provides 100% waterproof protection sandwiched between a brushed polyester knit face and backer so that you can sneak through the storm undetected.The minimalist design is highly packable, and full side zips allow for simple and stealthy on and off. The Jetstream Jacket is the mountain hunter’s workhorse, keeping you comfortable and focused in cool temperatures, high winds, intermittent precip, and everything in between. The GORE® WINDSTOPPER® Softshell fabric is 100% windproof to minimize the effects of windchill. Yet it expels perspiration, forming a microclimate around your body that is both warm and dry. With proper layering, it will take you from the first coldsnap to the end of the season. Lightly insulated with moisture-wicking Micro Grid fleece, the Jetstream Jacket is athletically cut to fit your form and eliminate bulk. The highly durable 4-way stretch polyester weave, aggressively articulated, offers free range of motion. The dropaway hood keeps your head and neck warm, and cinches to seal out drafts. With an advanced Durable Water Repellant finish, light precipitation beads up and rolls off, helping to keep you dry when small storms crop up. Two zippered hand pockets, two zippered chest pockets and a single breast pocket cache necessities like your rangefinder and GPS unit. A strategically located forearm pocket is perfect for diaphragm calls or wind checker(available on the Open Country version only). Full pit zips create efficient convective cooling during periods of high exertion. Dlhé rukávy a nízka manžeta okolo krku zaisťujú u trička Core Lightweight Crew perfektné odvádzanie vlhkosti a súčasne skvelé maskovacie krytie. Technológia trvalej ochrany proti zápachu Polygiene® neutralizuje telesný pach tým že zastavuje rast baktérií a kvasiniek, ktoré spôsobujú zápach. Séria CORE Lightweight je základ pre nosenie priamo na kožu pre vysokú záťaž. Je priedušný a aktívne odvádza vlhkosť od kože vďaka svojej dvojzložkové konštrukcii z polyesteru. 29 UPF w/ no chemical treatment. Flip up collar for sun protection. Thoughtfully mapped fabrics provide air-conditioned comfort. Knit panels built into this shirt provide stretch in key areas. Wicks sweat, dries fast and keeps odor in check with Polygiene. Used alone, the Ascent Shirt’s overall lightweight construction and mesh material under the arms, gives a cooling advantage while hiking in warm environments. As a base layer, the Ascent Shirt proves to move moisture rapidly, ensuring proper thermoregulation. 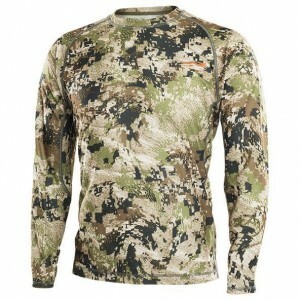 Innovative This technical hunting shirt will be your go-to in the early season. The Ascent Shirt features a lightweight but durable nylon body and polyester knit sleeves for the ultimate in fit and function. The collar on the Ascent Shirt can be worn up for additional sun protection, or folded down and out of the way. Treated with anti-stink Polygiene®, the fabric fights odor and dries quickly when you’re moving fast. 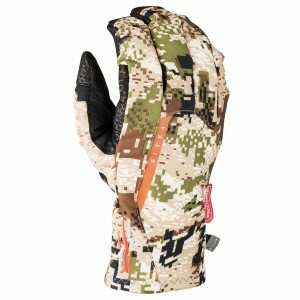 Mesh underarm panels and chest pockets provide additional ventilation. Conclusion A perfect complement to the rest of your Ascent System, this shirt offers ultimate breathability, ventilation, and innovative styling in a technical shirt.